Customize your Flicks home theatre seating in over 100 different leather choices and 50 different fabric choices in multiple seating configurations. 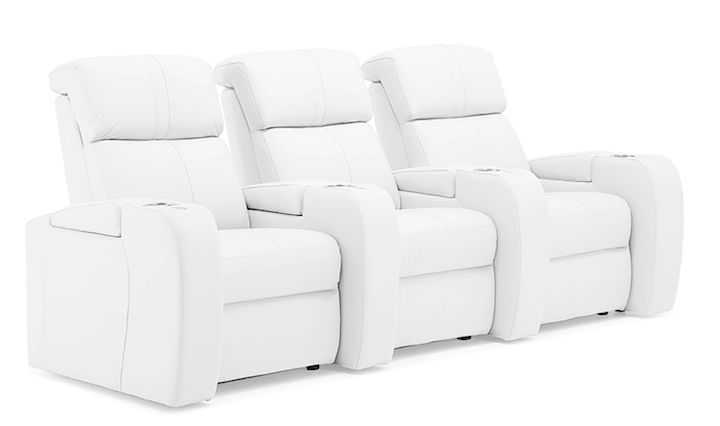 Visit our stores in Agoura Hills or Oxnard to design your custom Flicks Home Theatre seating your way today. The contemporary Flicks collection presents a refined take on traditional home theatre seating. This collection offers endless ways to personalize your comfort. Unique features include built-in power recline and headrest activation, a multi-color LED cupholder and ambient ground lighting with seven different colours and three light intensities and a switch with two memory buttons and a USB port, making the Flicks a delightful choice for home theater seating. Clean, sleek lines defined by topstitching enhance the modern styling of this collection. Full chaise seating, with a foam seat and back provide superior comfort and support, perfect for lasting comfort whether sitting or reclining. A seamless power recline and a headrest function that tilts forward to the TV viewing position allows you to customize your comfort. A multitude of straight, curved or combination configurations will suit any space and you can set up as many rows as needed to distinguish the lounging ambience for any occasion. The Flicks comes standard with ambient ground lighting for convenience in a darkened room and a luminous cool-factor sure to impress. As if these features were not enough, the Flicks is compatible with a variety of accessories, all designed to enhance functionality and keep up with the demands of a highly functional space. Design your Flicks Home Theatre seating your way with the configuration options below. Palliser Furniture is the leading manufacturer of leather furniture in North America. With over 100 different leathers to choose from, Palliser believes in creating quality leather furniture your style, your way. Palliser offers choices in seating configurations for any style you can imagine, customizable just for you in your choice of over 100 different leathers. Visit our stores in Agoura Hills and Oxnard to see the leathers and test drive our Palliser upholstery. 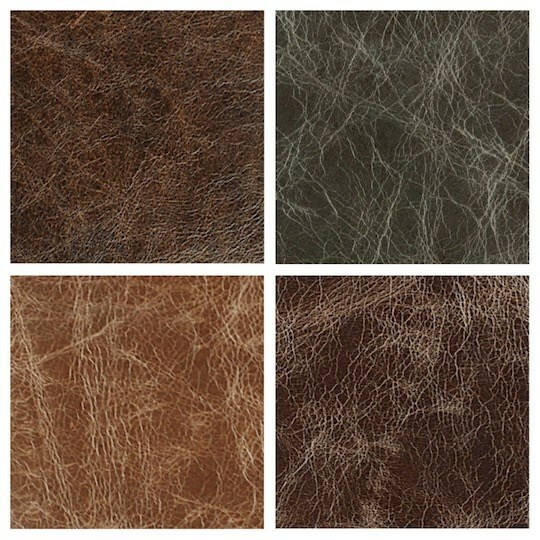 These leathers offer performance, consistency, and durability. They have been buffed or sanded to remove imperfections, creating a finish that enhances appearance and cleanability. Corrected leathers will not compromise value and are the ideal choice for those with an active lifestyle. These premium hides are the highest quality of leather, fully authentic because they retain character marks such as scars, stretch marks, and subtle shade variations. Over time, these leathers soften further and develop a beautiful patina, taking on a final finish that is truly unique. Leather improves with age. It will not wear down, but will develop a unique character. Leather breathes and is comfortable in both winter and summer. 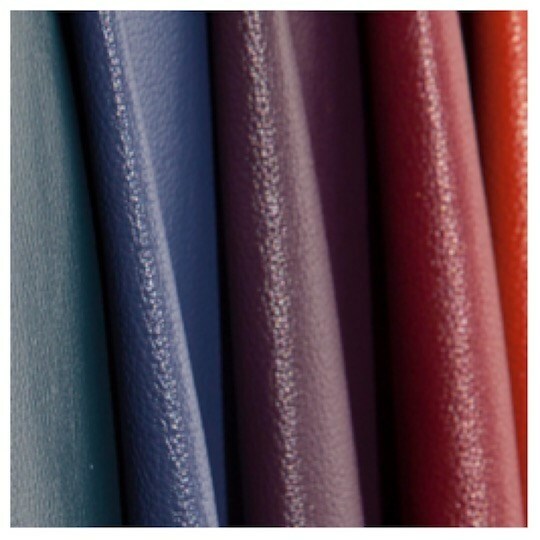 Pigmented and Semi Aniline leathers undergo careful processing to make them resistant to fading. Leather is easy to keep clean - no lengthy or expensive procedures are required. Curious to See the Huge Selection of Leather From Palliser? Click here to see over 100 of Palliser's different leather choices by linking to Palliser's website. Under TYPE in the upper left hand corner of Pallisers web page select LEATHER and browse all of Palliser leathers. Then come see the leather samples in person to design your Palliser your way at Reeds Agoura and Reeds Oxnard. View Pallisers flip book below and learn about Palliser Essentials of Leather.